Now I'm really home! It's always bittersweet to come home. On one hand I'm happy to be here with my "things" (computer, Tivo, TV, bed, kitchen, tools, etc). I can move around or not as I please. I don't have to be nice to anyone.....except myself. On the other hand I miss everyone! I've been in the company of at least one of my grandchildren everyday for the past month and I miss them! I never get "too much" of them! My children and their spouses are all such good and interesting people that I don't tire of their company, either. I've unpacked, organized and reorganized my jewelry making supplies and I'm gearing up for a full month of teaching! 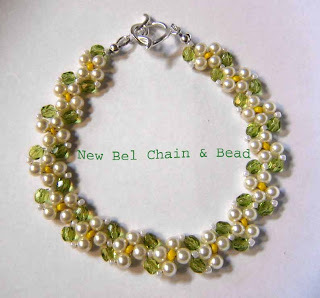 The picture here is of a bracelet I call Daisy Chain. It is made with the pattern Victorian Garden. My teacher, Linda Wilder, of La Mesa, CA taught me this while I was there in early December. It is a big hit and this is my version of it with all pearls instead of the pearl and crystal combo. If you're in the Fort Pierce, FL area I will be teaching this at Beads and Baubles the end of January. If you're in the San Diego area this pattern is taught at the Bouncing Bead in La Mesa.